Hi! 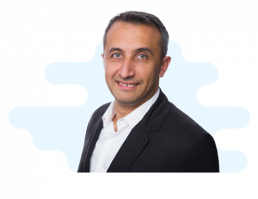 I’m Sorin Cosmescu, computer science graduate, CEO of EXE Software, and I’ve spent the last 15 years developing cutting-edge software solutions for clients across the globe. At EXE Software we believe in partnership with our clients and in creating together highly effective and amazing software solutions at a great price. We never compromise on quality and we are committed to teamwork and innovation. I am one of the founding members of EXE Software and a software development manager. 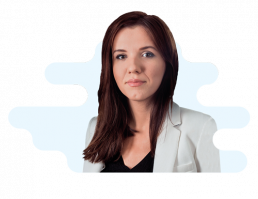 A graduate of the University of Bucharest, specialised in informatics, I’ve always been passionate about data base systems and their applications. I think a company absolutely needs essential and relevant information about its activity and the market it belongs to. Thus, the most important results in the career of my company and of my own are the moments when our clients can base their decisions on the information provided by our software programs. Hi! I am Gabriel Cosmescu, technical support manager with a bachelor’s degree in computer science. I also have extensive experience in managing and implementing ERP projects. I believe in honest communication and I do my very best to be a reliable colleague because I know the meaning and value of team work. Listening to our customers and understanding their existing and future requirements is vital in maintaining a high level of satisfaction. I can’t wait for you to become our client or colleague! Hi! My name is Karina and I enjoy taking the lead on HR processes at EXE Software, whether it is about recruiting talent, developing benefit plans or administration. In my opinion, HR is a dynamic department where empathy and a well-organised work style are highly necessary. Working in this area is both challenging and rewarding, because I find fulfilment in helping EXE Software achieve its objectives through human capital. 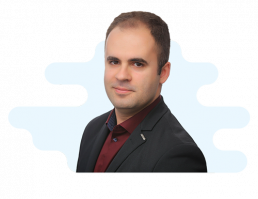 Hey, I’m Catalin Adam and my role is to manage EXE Software’s product and services portfolio and manage the sales team. Previously I worked in companies like Accenture and Electrolux. I see my role as a customer oriented, digital solution designer. My experience is focused on working with innovation management, marketing and commerce tools and I have delivered enterprise solutions on a global level in international environments. I am an analytical thinker and a fast networker with experience in delivering results in short time frames with limited resources as well as managing parallel projects and work stream simultaneously.